A few days ago, a number of Codemasters' racing games were quietly removed from Steam: Grid, Dirt 3, and F1 2013. 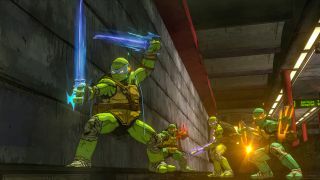 Now, Platinum Games' Teenage Mutant Ninja Turtles: Mutants in Manhattan has been silently whisked away, as have its 2013 predecessor TMNT: Out of the Shadows, along with The Amazing Spider-Man and its sequel (all four games were published by Activision). What's going on? A stealthy game-napper pinching digital titles in the night; a rogue hacker causing mischief? In the Curious Case of Codemasters, it's most likely licensing issues—as in, licenses running out—and I can only assume that's the reason here too. However, as Platinum's Turtles game has only been out for around eight months, it seems odd that Activision would pull it quite so early.